AireSpring’s Bring Your Own Bandwidth (BYOB) offering is designed to allow mid size and multi-location enterprise companies to access the AireSpring VoIP infrastructure for the delivery of the full suite of AireSpring IP voice services. AireSpring today announced from the Channel Partners Expo that it has significantly expanded its support of multi-location enterprise customers with a customer provided bandwidth offering. Enterprise customers will now be able to connect to the award winning AireSpring Unified Communications as a Service (UCaaS) next generation network via their existing MPLS or public internet connections. AireSpring’s Bring Your Own Bandwidth (BYOB) offering is designed to allow mid size and multi-location enterprise companies to access the AireSpring VoIP infrastructure for the delivery of the full suite of AireSpring IP voice services. These products include Cloud Hosted IP PBX, SIP Trunking and analog/POTS replacement service. Mr. Lonstein gave a scenario where an enterprise customer would connect multiple branch offices and headquarters locations via a mix of different connectivity solutions – both fully managed Airespring connectivity locations as well as branches served by existing MPLS and/or public internet bandwidth. Even with customer provided broadband access, Airespring still delivers a fully managed gateway device which offers Voice Quality Management and aids in traffic prioritization over public broadband infrastructure. While this cannot replace a true fully managed private network, the engineers at Airespring have worked hard to bring the quality of voice over a public infrastructure to as high a level as possible, based upon the quality of the existing connectivity. 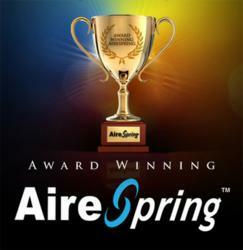 Whether customers choose to combine all of their diverse networks via AireSpring’s “Product of the Year” winning MPLS Mesh solution or simply layer AireSpring’s robust voice offerings over their existing network, AireSpring’s voice, data and networking solutions are designed for flexibility and affordability.